The Performing Dogs were kept in three separate exercise areas along the walkway where we saw the catering vans. Look at the intensity in this little one's eyes. 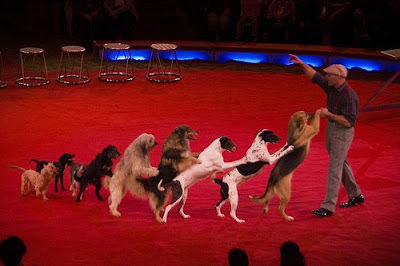 You are see more of these lovely Circus Dogs on Riviera Dogs today and over the coming days. The dogs come from Germany and are part of Wolfgang Lauenberger's Performing Dogs. See photo below - not one of mine, but taken, with thanks, from the non-official Festival International de Monte Carlo website. If you want to see photos of other circus acts performing in Monte Carlo, this is the place to go. The canine looks a bit forlorn. Perhaps it's just me, but I hate to see animals performing as these are in the bottom photo. It's so unnatural and in my opinion so insulting to their nature. working and performing and suffering. Sad! Looks like the circus is a pretty big event! I've never actually been to a circus show. That first photo is so intense -- look at that sweet face! Gorgeous, Jilly. I think these dogs probably have quite a good life, they certainly don't look undernourished or afraid and looking at the ones at the back their tails and ears are up and they look raring to go. When we hear such horror stories as what it was like for Mistral and Mia before Jilly took them I guess these dogs are OK, I hope so! It really was hard to judge how happy these dogs were. They were in runs, being stared at by lots of people. I didn't see them with their owner/trainer. Normally dogs like to work, to please, they like to have a job to do. And these certainly have that. As you say, Freda, considerably better than so many shut up in refuges and worse. Circuses will always bring up arguments from all of us, I'm sure - for and against. Lovely portrait of this black beauty, Jilly! Something about his eyes and ears draw me right in. I wish my nails looked as well cared for:-). I am not sure I would have stuck my hand inside! HE is a beauty for sure. The bottom shot is cute. I could never t rain my dogs to do a darn thing! The dog in the first picture does look intense. Reminds me of my puppy as he stares like that when he is being told not to do something and then keeps doing it when i look away.